Practical tips and inspiration for your home and garden. Real tips for real life from Julie Harrison. If you love Orchids, keep reading. If you hate Orchids because you've never had good luck with them, KEEP READING! I had no clue what I was doing at 14 when I bought my first Orchid plant with my hard earned babysitting money. Guess what happened to my first Orchid? I killed it. Imagine me...an Orchid murderer! Gasp! I've learned a lot since that first Orchid and now nearly every room of my house is graced with at least one. Orchids are really a lot easier than most people think and once you get the basics down you will be rewarded big time! Anyone can take the class- you don't need to be a Suffield resident! Description: Phalaenopsis: This workshop introduces the Moth Orchid as an easy Orchid for beginners. Julie will discuss this Orchid’s growth requirements, their natural habitat and briefly review their plant structure. Julie will demonstrate how to ‘dress up’ an Orchid for the home and one Orchid will go home with a lucky class participant. Registration deadline is Monday April 20 and/or when enrollment reaches maximum capacity. Limited enrollment. Age: adult but high school students interested in gardening are also encouraged to enroll. The orchid is a diverse and widespread family of flowering plants, with blooms that are often colorful and fragrant. They automatically make the surrounding calm and lovely. 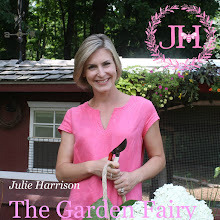 Copryright by Julie Harrison for Julie The Garden Fairy. All content is property of Julie Harrison. Travel theme. Theme images by merrymoonmary. Powered by Blogger.